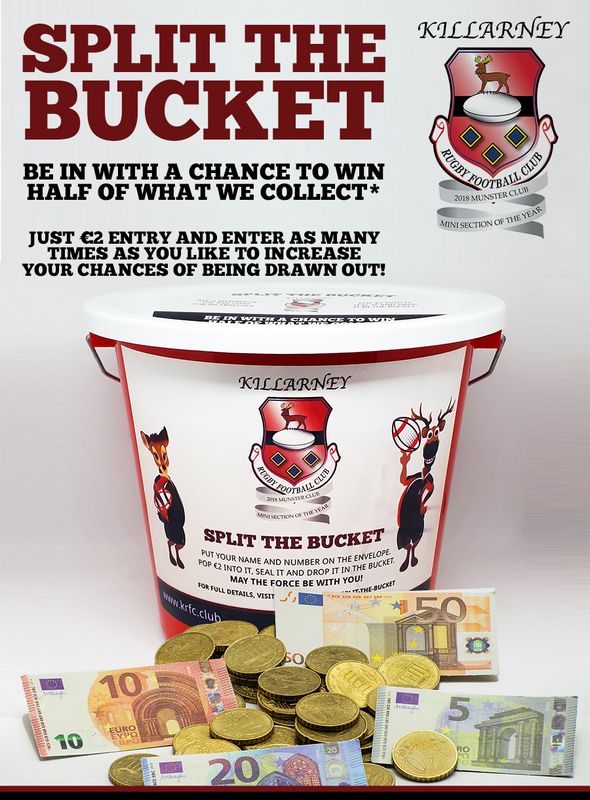 Killarney RFC are delighted to announce the launch of a new fundraiser project called Split the Bucket that will be starting in February here in Killarney in a number of local bars and shops. To enter the Split the Bucket draw, simply pop €2 into the envelope provided and write down your name and phone number along with the name of the serving staff. Buckets are generally collected on Thursdays and new buckets put in place. All buckets are secured with numbered ties. The numbers are recorded when placed on the bucket and verified before the bucket is opened. The draw will generally be held on Sundays at a single designated bar. A different bar will be chosen each week and will be announced on KRFC’s social media. All envelopes from all buckets will be placed in a large transparent container and a single envelope picked out. If the envelope picked out does not contain €2, it will be disqualified and another envelope chosen. The staff member whose name is on the envelope wins 10%, with the remainder then being split 50:50 between the person whose name is on the ticket and KRFC. The draw will be broadcast on Facebook Live at the designated bar on the designated date to ensure full transparency. 4th Draw – 03rd March 2019 (Courtney’s Bar) – €402 won by Padraig Murphy and €89 won by Kevin Kelleher.